The final scene of I Saw The Devil - where our protagonist puts the antagonist under a setup in such a way that he dies in the hands of his very own - it pierces your senses, wrecking your judgment to bits, making you sympathise with the devil in a way you'd feel that it is wrong. Such is the brilliance of the vengeance. Because it has to be crude, raw and real. It should shatter you when you see it on the big screen. And Ek Villain shattered my imagination in such a way, that only hatred remains in me for Mohit Suri. Why, why would you destroy the brilliance of signature Korean thrillers ? Why can you not have an idea that's original? Why would you put us to shame by making a mainstream Bollywood movie which reeks of nothing but a propaganda to make money? And many such unending questions, rhetorics , cross my mind as I sat in the theater, seeing the essence of I Saw The Devil being shredded, page by page, and being burned down to ashes, frame by frame. The concept of cinema is to entertain the people. Sometimes, they come up with moral responsibilities of educating the masses, and yet sometimes, they portray the tragedy of real life. Mohit Suri's Ek Villain lacks the soul that it takes to make a vengeance thriller. We don't need backstories, we don't want unnecessary songs interluding the flow, and most importantly, we don't deserve such stupid screenplay that would compel us to bury our faces in our palms in dismay, multiple times. The actors seemed to be the director's puppet - it seemed as if they were there to follow orders. Except for Riteish Deshmukh's commendable performance, everybody else seemed to lack conviction. Mohit Suri dotted every i's and crossed every t's when he lifted the idea from I Saw The Devil. He then decided to sugarcoat it with Bollywoodish dramatization. 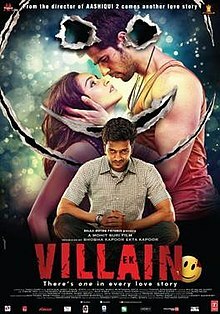 And so, Ek Villain ended up being a cover-up act, rather than being an attempt to make a good thriller. The love songs were wasted, sadly. But that's about it. If you're a person who loves to watch movies and take them seriously, praising the effort put in every aspect of it, I would recommend that you go watch I Saw The Devil instead of watching this joke. If however, you love cheesy lines flying in the air in every direction then I'd say--OH HECK! DON'T WASTE YOUR TIME WATCHING EK VILLAIN! I HATE YOU MOHIT SURI FOR RUINING ONE OF MY FAVORITE KOREAN THRILLERS OF ALL TIME. And I say this on behalf of every person who has watched the original Korean movie: Trash it. I salute sir , even after knowing that this is going to be an awful movie u went anyway just to write about it. i saw it today dont worry i downloaded it and saw it in 5 minutes. i should have banged my head in the wall instead of ruining my 5 minutes. Such rubbish should be banned immidiately.